The Chinese Puxing PX-777+ radio is the easiest radio to program ever! You will never have to refer to the manuals over and over when you need to change a channel or program a whole new one. Basically you know how, assimilated all the stuff below, but you need to refresh your brain the next time. This cheat sheet is what you want! Your browser does not support iframes, but you can visit the above sites and click on the "visor card" link to get it. As it comes out of the box, the PX-777 has two modes. The first is the traditional VFO and Memory modes. In this mode, you can toggle between VFO and a memory location by the use of the VFO/MR button, the rightmost of the trio of buttons below the display. Where the frequency is shown on the left and the memory number on the right. Your numbers may well be different if you have nothing programmed yet. In radios like Yaesus, etc., That is all you get! To enter memory information, etc in that mode, you should read the manual that came with the radio. You will be as lost as a Yaesu user once doing it that way. The second is the enhanced PX-777+ CHANNEL mode. You toggle between those two modes; by holding the [ENTER] while turning the radio on. Try it, you have nothing to lose. You will be mistified by the CH-001 tag at first. The number, like 001, corresponds to the memory number. If there is nothing in that memory, like when you first got the radio, it may be on some random, maybe even a non-ham channel. Don't confuse channel mode with the memory function of the VFO/memory mode. Not the same thing at all. The trick on this PX-777 is to avoid using the VFO/Memory mode. If you program into your radio all the channels you need, you may seldom need to use your radio in the vfo/memory mode. But, it is good to know how to use the vfo mode, as sometimes you get surprised by a new or changed frequency. Basically, you can program the radio using the SELF programming mode. As you scroll thru this procedure, it will ask you questions about the channels you want. It always starts at channel 1. You can program as many channels as you want. Now that you have all the background information, and understand what is going on, we are ready to program a channel in your radio. First, you want to have your radio in CHANNEL mode. Turn your radio on, and see what it displays. If it shows a frequency, its wrong. Turn it off, hold [ENTER] while you turn the radio on. It will display something like CH-001. Second, you want to have the radio come on in the SELF programming mode. Refer to the radio's picture. Third, turn your radio OFF. 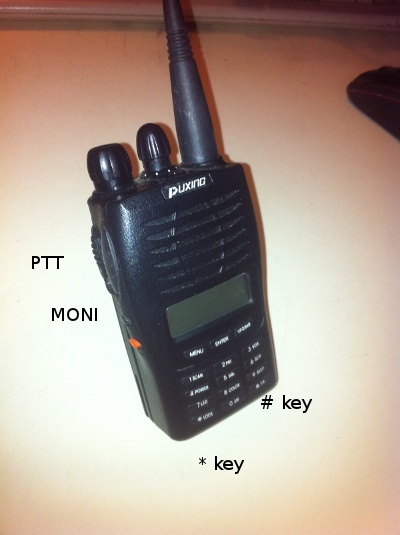 Now hold the MONI key (just below the PTT), and the MENU key while you turn the radio on. Continue to hold those keys until the word "SELF" appears on the display. If you let go those two buttons before "SELF" appears, it will not be in the proper programming mode. Remembering this is the first thing you have to remember in the future. It does take a bit of dexterity to hold those two keys while turning the radio on. You need both hands, one to turn the radio on, the other to hold the two keys. They do it that way so you do not accidentally enter the SELF mode. Fourth, hit the enter key. CH-001 will appear on the screen. If this is the channel you want, hit the [ENTER] key. Otherwise, turn the channel knob to the channel you want. Assuming we are programming the Nome, Alaska channels, lets start with that channel CH-001. Press the [ENTER] key. A random frequency will appear. Using the keypad, enter the proper frequency; all six digits 146940 without periods. When you hit that last "0" digit, you will hear a double beep. This was your receive RX frequency. Now, hit the [ENTER] key to go to the next step. If you want the tone, 100.0, you must put it in now. it says OFF. Press the [*] key once. The number 67.0 will appear. That is a PL tone, but you don't want 67.0, you want 100.0, so using the knob, turn it until it says 100.0. Hit [ENTER]. Note that on the right hand side of the display, little number 04 appears. This is the step number, 04 being the transmit frequency. Another random frequency appears. This is your transmit frequency, so enter 146340 and hit [ENTER]. The PL tone for you to transmit is next. It says OFF right now. SPaRC does not require a tone, so you can leave it off and hit [ENTER], but it does not hurt to send this tone. Just like above, use the [*] key and turn the knob to 100.0. Then hit [ENTER]. The next question (6) refers to "busy carrier lockout", which has to do with scanning. Leave it OFF for now and Hit [ENTER]. Question (7) refers to "Add/Delete priority channel." Again this has to do with scanning. Leave it at DEL and hit [ENTER]. Question (8) refers to high/low power. Unless you specifically need a half watt power, leave it on H and hit [ENTER]. Question (9) asks for WIDE/NARROW. As hams, we use WIDE transmissions. It is not too bad if you choose the narrow function; but you will not sound very loud at the other end, IRLP users may want to experiment. If you are told that you are too loud or "hot" try "narrow" here. For now, leave at WIDE and hit [ENTER]. Question (10) is for the channel Name. You will see six dashes, which are changed to letters, numbers and some characters using the knob. Play with the knob to see for yourself the available characters. This being the first Nome channel, I put in OME 94. Turn the knob for the letter "O". You step to the next position using the [#] key on the keypad. Put in the letter "M" and hit the [#] key. Likewise for the "E". Now, to put a space in, hit the next key and rotate the knob for a blank space. It is between Z and the number 0. Similarly program in the digits 9 and 4. Now you are done with this step, so hit [ENTER]. Channel names can be displayed two ways: Either Either as "CH-001" or "RIVER7" style. You can select the method in the radio's menu, item #15.
you do not turn NAME to ON, it will display the "CH-001" notation. You have now finished your first channel. The display now says CH-002. You can ... and should continue to program channels, so proceed with the info for channel 002 etc until the table has all been keyed in. It is not too tedious. But can also stop here, with just the one channel to see how it turned out. Turn the radio off, and back on. When you do so, you will see OME 94 01 as the name. The little 01 on the right tells you this is channel number 1. You can add channels by turning the radio on to the SELF mode, and adding channels. You can edit channels by turning the knob for any existing channel number, then hitting the [ENTER] to get the receive frequency, and continue with the enter key to get to the parameter you want to change. Change or edit the entry, hit [ENTER] and continue until done (past the name). When you see the next channel appear, you are done. Turn radio off to exit. Your manual has all this in it. It is a bit light on some explanations, and this short tutorial explains it better. You can contact me, Ramon Gandia AL7X at 907-304-1053 if you have any questions on this wonderful, lightweight radio!